Celebrate Good Times at Beadhive! Come on...celebrate birthdays, ladies night out, or gather around with community groups and get to know each other while you bead. Beadhive has a great space for parties located on our lower level. Bring your special birthday kid and their friends to Beadhive and celebrate another year in the life of your child. We encourage you to bring a birthday cake and party treats to enjoy after the kids create beaded jewelry. 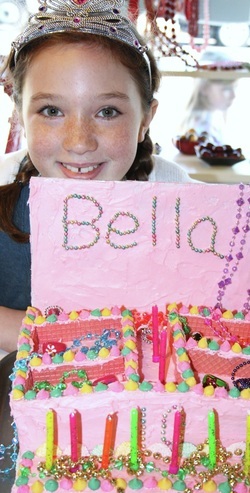 A two-hour party for 10 is $180.00 and includes a tasty bead buffet that the kids will devour! They'll be busy little bees making two jewelry projects, a bracelet and a necklace. A staff members instruction is included in the price and they will be present to guide them along in their beading fun! Additional guests (more than 10) is an extra fee of $20.00 per person. This extra fee covers additional materials and a second instructor. A $75 non-refundable deposit is required to hold your date. Call with questions! Parties for Grown Ups !! Bring in friends, co-workers, family, or corporate teams for a very special get together at Beadhive! You and your guests can choose to make beautiful bracelets or necklaces. What a way to make a memorable event! The fee for a 2 hour party in our lower level classroom is $100. A basic beading class, an instructor, and consultation on design is included. Beading supplies are an extra fee and determined by the guest of honor. Feel free to decorate the room, and set out snacks and your favorite beverages. Please call or stop in Beadhive to book a party and discuss the details and options of your event. A $50 non-refundable deposit is required to hold your date. Guests are asked not to bring their personal beading materials to a party. Parties can be schedule anytime during regular Beadhive hours, as long as there is not a class or a previous party planned. Call 612-823-1112 for more information or to book a party.